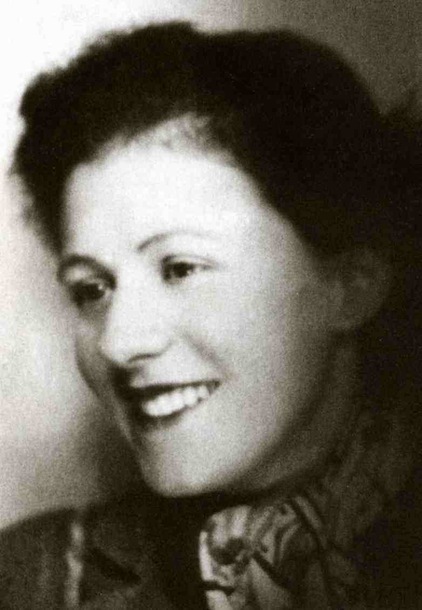 Andree Girard’s experience of the deportation and concentration camps at the height of the Second World War became part of an illustrated serigraph edition of O terre de détresse, a suite of poems written by Lucienne Laurentie while imprisoned at Holleischen concentration camp, with illustrations by Andree’s husband, Andre Girard. Andree never really spoke of this experience in any sustained detail, preferring to focus on the present. This is a brief reconstruction of the events that led to the camps and the serigraph book, which was printed in February 1951. You can download the chapter from the link below. I used to have in my pockets notebooks full of versions of the Stations of the Cross—so much so that when I was sent to America in 1944, I had only with me these pictures. When my art dealer proposed to exhibit them I was astonished. Such a distressing subject, such a limited number of pictures! His wartime experience found expression through sacred art, and became a new point of departure for his images. After the war, Girard never returned to drawing political caricatures for the press; instead he opted to make sacred and secular art. He worked in an impressionist style akin to Pierre Bonnard, one of his two teachers, whose shattering of light into gemlike points Girard learned to employ. The other was Georges Rouault. Girard shared Rouault’s use of heavily outlined bodies, but differed by rendering them as angular and bony forms. Ultimately, Girard’s Jesus is born of crisis, a figure that has seen the limits of human fallibility. He is marked by the austerity of war, yet radiates light. Girard sought to depict the transformative capacity of light to symbolize the presence of the divine and its struggles. Translucent, pale or colorless, the power of light emanates from the body of Christ in his drawings, prints and paintings. The artist symbolized this divine power as an array of lines that surrounded Christ and those who shared this quality. Over the next decade, Girard’s Jesus transformed from an identifiable likeness of the writer Andres Suares to a less specific rendering of Jesus. Their friendship deepened in Antibes during the occupation of Southern France, and they corresponded regularly until Suares’ death in 1948. St Ann Chapel’s architect Vincent Raney designed a modern church, which features a series of angled panels that line one side, allowing light to penetrate the space indirectly. Girard drew his sketches for the Stations of the Cross on the plaster surface of the panels. Next, the final images were painted on canvas and mounted on the fourteen panels. He donated a series of 14 ink sketches to Stanford University. The Fourteen Stations of the Cross has its complement in the four stained glass windows at St. Ann Chapel, which are dedicated to the teachings and story of Jesus. Rather than go with traditional methods of stained glass panels, he instead painted directly on the glass. In his correspondence with his patron, Clare Boothe Luce, Girard outlines his reasoning for choosing these methods. 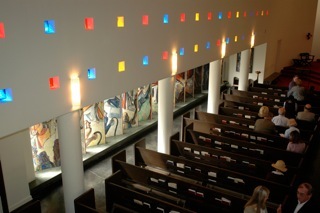 Luce financed the chapel’s building as a memorial to her daughter. For her, this project intended to signal that even in the US, there were spaces that proved modernism was compatible with sacred art. Girard thought of the windows as four sections of a single, enormous work that moved through primary and secondary colors: Yellow, Green, Violet and Red. He chose the colors based on one of the earliest color canons developed by Pope Innocent III in the twelfth century, and by the sixteenth century, the rules were fixed. Andre Girard, Judgement Day. Yellow Window, St. Ann Chapel, (1953) Detail. EFS 2007. Bignou Gallery, Recent Paintings by Andre Girard. Nov-Dec 1944. n/p. Correspondence, Clare Boothe Luce Papers, Library of Congress. Andre Girard, Stations of the Cross, handwritten essay, aft 1952. Courtesy Archives An. Girard, Paris. Michael Kunzler, Church’s Liturgy (Die Liturgie der Kirche, translated by Lit Verlag). NY & London: Continuum International Publishing, (1995) 2001, 132. Bob Sturia, “New Murals for Student Chapel: Palo Alto Work Will Serve as Luce Memorial.” San Francisco News, Thursday October 23, 1952, Sec.3, p.27. — Andre Girard, 26 June 1952. Stations of the Cross, No. 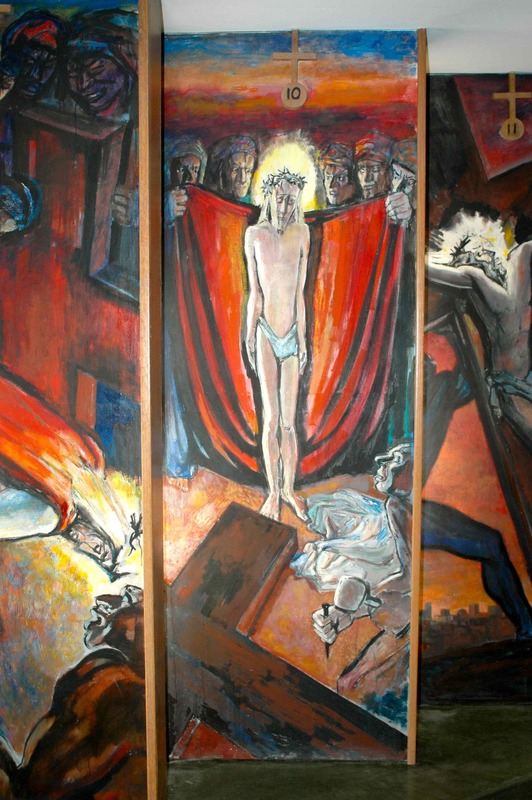 10, Jesus stripped of garments (1952). Photo: Thomas Sacco, 2006. Station No. 12. 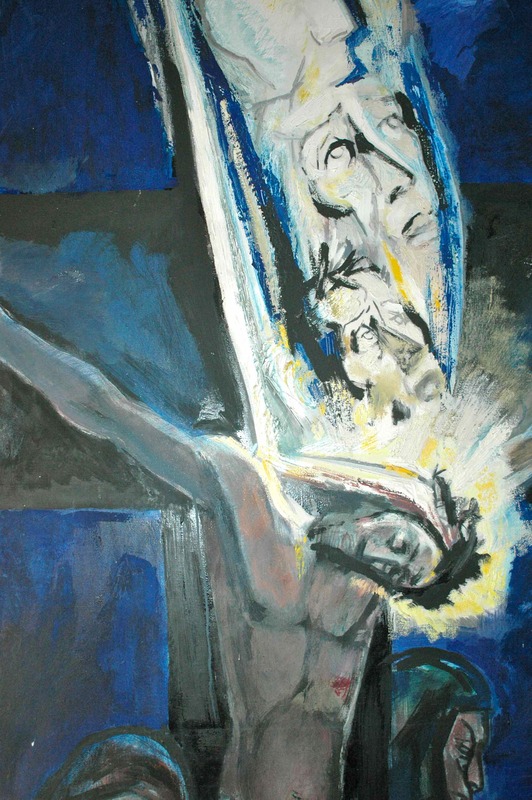 Death of Jesus (1952). Photo: Thomas Sacco, 2006. Detail - Andre Girard, Station No. 12, Death of Jesus (1952). Photo: Thomas Sacco, 2006. This companion site for the forthcoming book An Artist at War: Andre Girard (1901-1968) comprises a selection of images from three major periods of Girard’s life, his involvement in art and advertising of the 1930s, the creation of his resistance network CARTE in the early 1940s and his sacred art of the 1950s, which includes the commission for the decoration of St. Ann Chapel in Palo Alto, by Clare Boothe Luce. Girard’s art and his involvement with different technologies – theatre, film, radio, television—span three decades of continued experimentation. He sought to convey the transparency of light and movement despite the limitations of media. 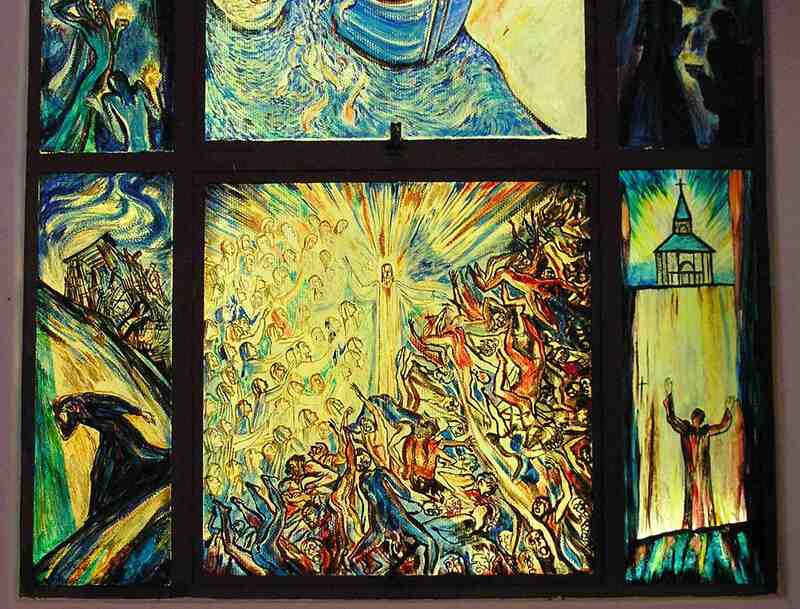 Perhaps his most audacious attempt was painting on glass at Saint Ann’s Chapel in 1953. 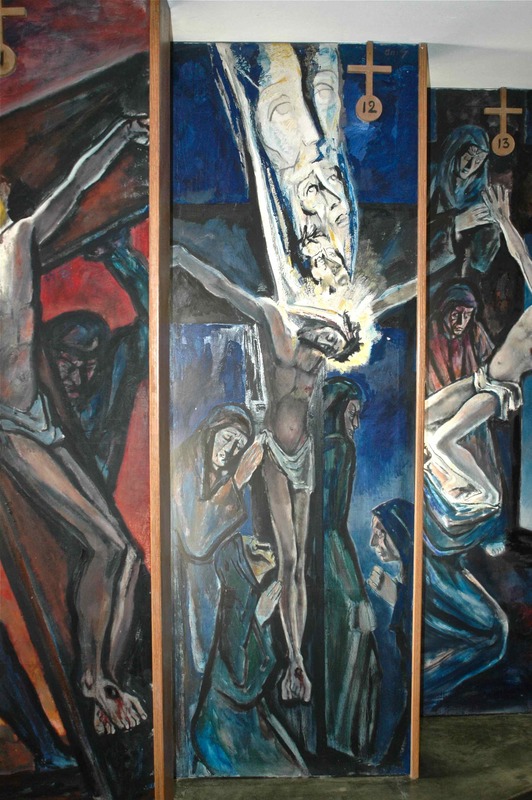 Since Easter is upon us, we’ve decided to show some images of his windows and Stations of the Cross. The Chapel is a small, modern brick building, designed by architect Vincent G. Raney in 1950, built by Luce on behalf of the Newman Club at Stanford University. Girard’s commission was for a series of four narrow 18′ windows, each dominated by a different color that together constitute a multicolored mural with scenes of Jesus’ teachings. Directly across from the windows are his series of 14 Stations of the Cross. 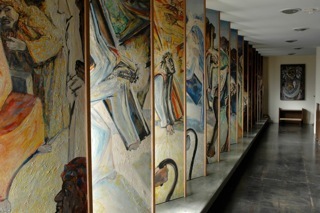 Sequentially arranged in simple wood frames, they were arranged in a row with each painting angled slightly so that natural light illuminates the panels.